People are going to think that I planned my vacation in Bend on purpose at this time to coincide with Bite of Bend, but I swear I did not. I only found out about it the weekend we arrived in Bend. And it just ended up that we were going to be back in Bend in time for the festivities. 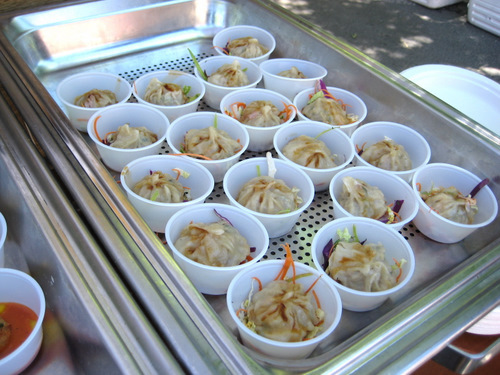 Bite of Bend is a local food festival. But really, it’s just an excuse to get drunk outdoors and eat street food. Aren’t all food festivals that? 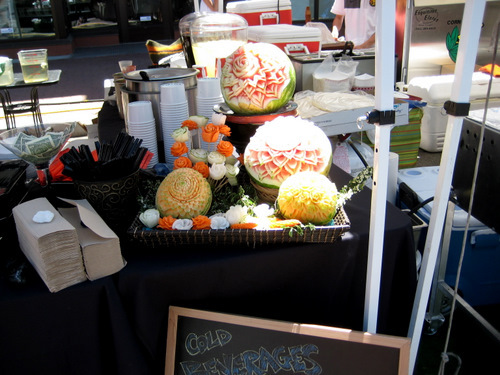 There were food vendors, sellers hocking their wares, live music, a beer and wine tent, and a top chef competition. 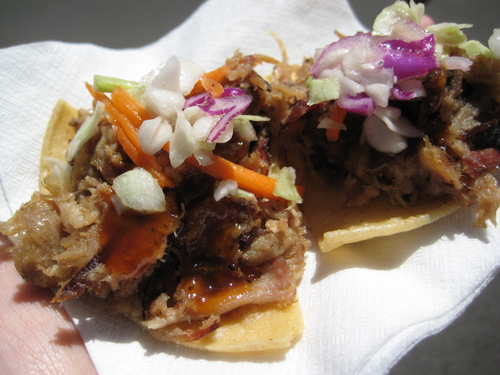 This one vendor, who was selling sauces, was giving away 25 cent samples of pulled pork on tortilla chips with a little of their sauce on top. All we knew was, they were the cheapest, most filling, and delicious snacks there! We certainly got our $1 worth! 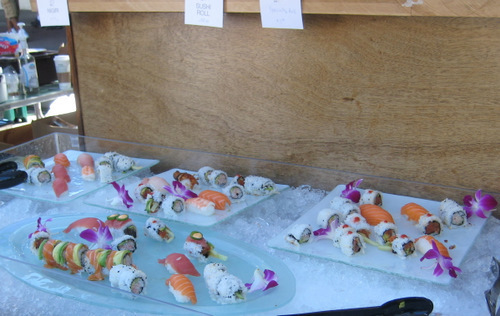 Sushi seems like a crazy thing to be trying to dish out at an outdoor food festival held during the summer. But we weren’t complaining. These ended up being really cheap too. It’d cost you a lot more to go to a restaurant, or even pick this up at a grocery store. And I felt quite comfortable with them being on ice. 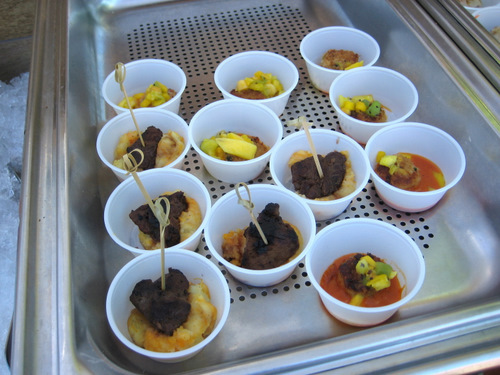 The same spot also had little bites of appetizers too – crab cake and skirt steak. 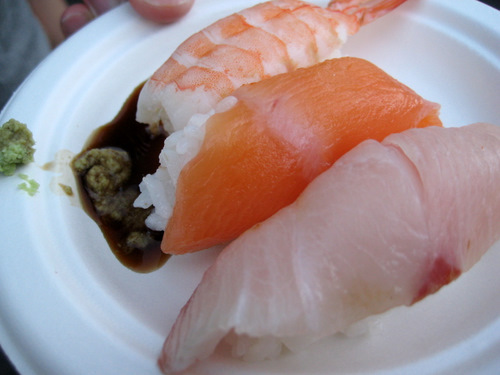 Cheap, fresh, street sushi! Come and get it! Bite of Bend actually was an all weekend affair, so on Saturday night, we did go in for a sneak peek. And since we were hungry for dinner, we did get some of this “thai” food. I’m not sure what about it made it so thai, that’s why I didn’t really consider it thai food. 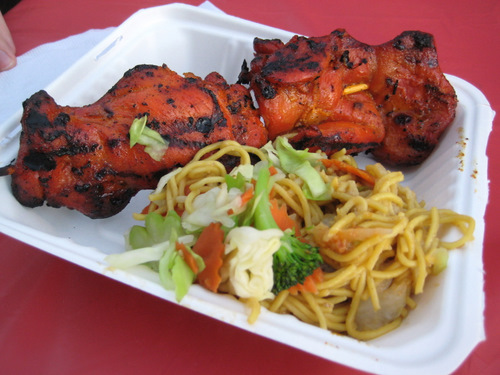 But I love me any street meat on a stick and a plate full of noodles. Here they are grilling up the sticks. I always wonder what makes these suckers so orange/red. They’re not spicy, so where does the color come from and what purpose does it serve? 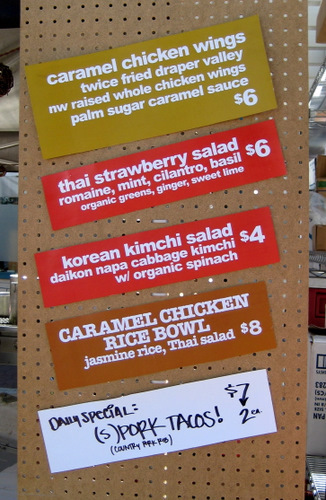 Speaking of thai, there were three thai vendors at Bite of Bend. That’s a lot, don’t you think? 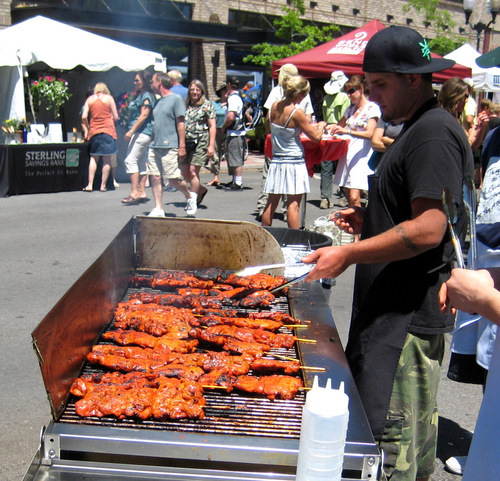 Any good food festival has to have bbq, and we had a few here in Bend. 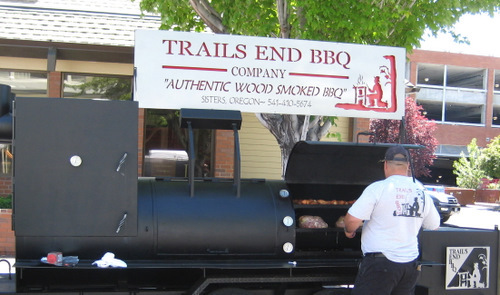 Trails End BBQ came from the nearby town of Sisters, and had a pretty impressive setup. 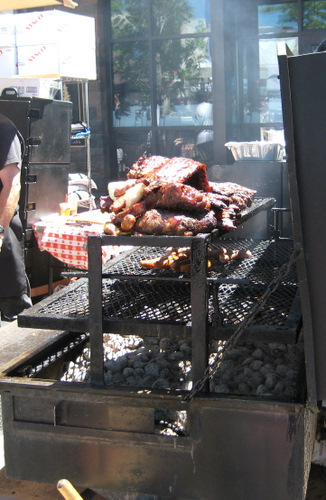 Another vendor had a much smaller rig, but they still had a nice pile of meat going on. 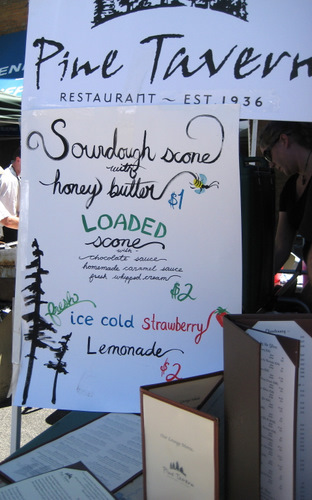 These people were selling sourdough scones with honey butter! They looked delicious! And while there were fancy treats, there were standard treats as well. 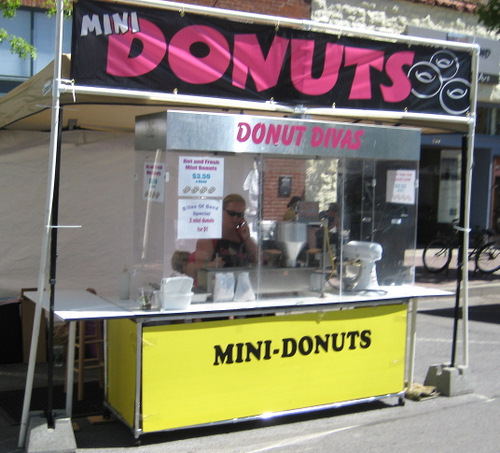 Little mini donuts! Definitely John Belushi’s favorite vendor of the entire festival! 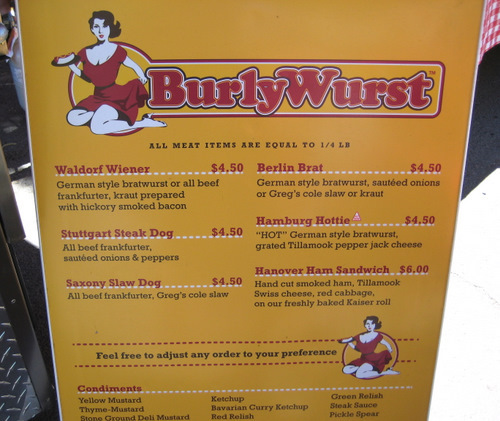 Wurst, anyone? They even have curry ketchup! Bend is also starting to have their fair share of food trucks (aren’t they all?). Spork was offering up this variety of options. $2 pork tacos! So cheap! 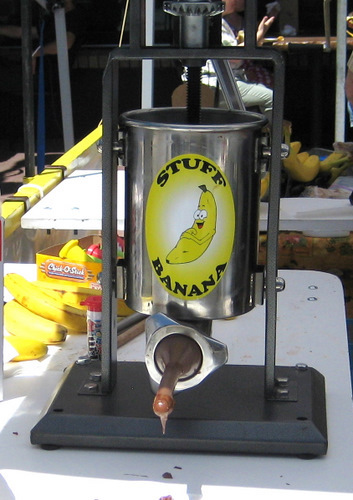 But the grossest thing we witnessed at Bite of Bend was this stuffed banana vendor. He would core out a hole in a banana and then stuff it with crazy things, like nutella or chick-o-stick. This was a level of decadence beyond me.